Rescue horses do not usually end up in the predicament of having to be rescued without a good reason. Sometimes they have difficult temperaments, sometimes they have physical problems - often it's a complicated mixture of both. Sources of the problem: do we need to rescue horses from human values? 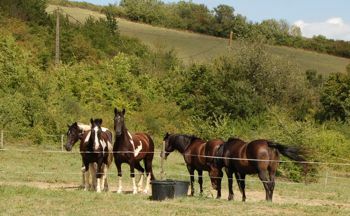 Many horses sadly end up being unwanted and rejected by their owners. The lucky ones are rescued and the rest are put down. 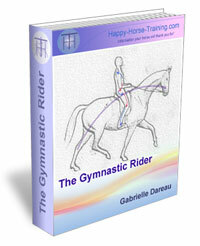 The bottom line is whether a horse is of use to us in some way or not. In the majority of cases this means whether a horse is rideable or not. In certain cases a horse may be rideable but not handle-able, which is equally unsatisfactory, unless the horse is marvelous in competition. Our society seems to rate success more by the ultimate results a rider can achieve with their horse, than by the actual transformation they have made. 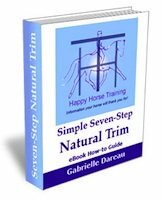 This is partly because it is more difficult to judge the A to B journey, but mainly because we are obsessed with the end result: whether or not, for example, we can perform a canter to walk transition, as opposed to improving the quality of the transitions when the horse is ready. 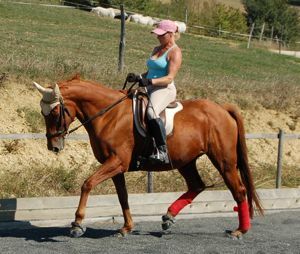 It is this result-based attitude which puts riders under such pressure, which the rider often transfers onto the horse. 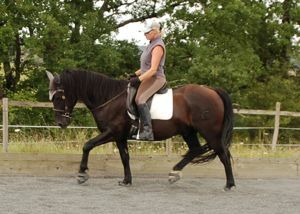 Most people only have one horse, and that horse must come up to standard. Surely the only standard of any importance is whether or not we are enjoying ourselves and feeling good about our relationship with our horse? Enjoying a horse can be as simple as just being in his or her company. Often when the pressure is taken off, true progress becomes possible because the right path to take becomes clearer and we can appreciate what we have actually achieved. If this philosophy were common there would be very few 'rescue horses' because all horses would be loved despite their problems. The mindset of constantly looking for ways to make our lives easier and faster can become our enemy. 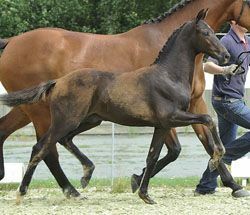 The situation now where we are breeding horses so talented that they can perform dressage movements which originally were the result of many years of training, by riders who had developed their ability intensively over years, is not as clever as it seems. Dressage sport horses are becoming like a race apart, gladiators with phenomenal power and suppleness - but where are the riders to match this? If they existed, as is claimed, there would be no need for rollkur, water-skiing on double bridles, and savagery with spurs. 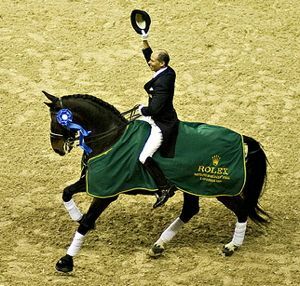 If good riders existed as the rule rather than the exception, we would see the most unbelievably beautiful performances imaginable, because true engagement with an ordinary horse is beautiful enough. True engagement of a horse of the quality that exists now, should be awe inspiring. 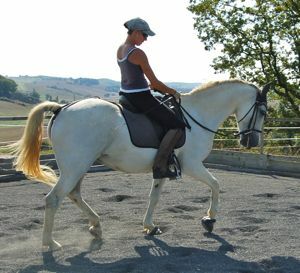 One of the effects of riders no longer focusing on themselves in terms of suppling and straightening, is that the disposability of horses is probably becoming more accepted. 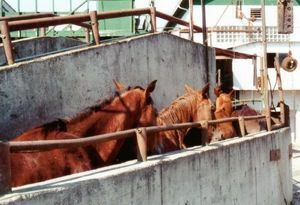 This means more pressure to rescue horses which would otherwise become just another forgotten story in a slaughterhouse somewhere. If we could appreciate our horses for what they teach us, precisely when they are difficult, the concept of rescue horses would be limited to those whose owners can no longer afford them financially. 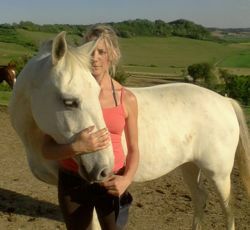 After all, valuing our horses is the same as valuing ourselves. Tricky horses make us more patient, more open-minded and more sensitive people and riders, when we are willing to stick with them. Most of the horses we have on our farm are what we would consider rescue horses, because they were suffering in some way in their previous situation. Here we have narrowed this list down, however, to those who had reached a true stale-mate in their lives. Interestingly, in each case the main reason things went so far wrong was a misunderstanding. This is good news because it means that there is hope for such horses. If we can find out what they are feeling and understand their reactions, it means we have a chance of turning their lives around and bringing out their talents. For us, this process is our passion, partly because it gives us the best opportunity to learn every aspect of horsemanship and improve our riding, and partly because when we give these horses a new start and a happy life, it makes us, and them feel good! Arguably the commonest misunderstanding we can make with a horse is when we don't appreciate how they feel. Many rescue horses develop a profound defensive reaction which has been misconstrued as what we would describe a 'stubborn horse'. Stubbornness is a complicated state of mind at he best of times. Many rescue horses develop a profound defensive reaction which has been misconstrued as stubbornness from the beginning. 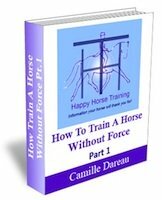 In our experience when a horse refuses to cooperate with us he or she will be a good reason, and forcing that horse will not address that reason. So even if the desired result is achieved that day, in that situation, the relationship between horse and human will have been damaged and the 'stubbornness' reaction will be reinforced. Another misunderstanding is often made when we judge a horse at face value because we can't distinguish a horse's basic character from the negative experiences they have undergone. Of course different horses will take on different behaviors depending on their nature, but the wrong management and training will take its toll on even the most reasonable personality. Our case history of such a horse is one we have described as an 'aggressive horse' because she was labeled as such before we took her on. These kinds of rescue horses are the exception - horses which are basically uncomplicated and talented, yet turn into monsters as a result of ignorance and narrow-mindedness. The third of our rescue horses has been referred to in his story as a 'nightmare horse' because by the time he had reached nine years old, he was neither rideable nor handle-able. The vicious circle of his life was again the result of a misunderstanding, the most fundamental misunderstanding of all - no one had been willing or able to recognize and accept his true identity. All of his life people had been trying to force him to be something he wasn't and he was not able to conform to their demands. Octavia's Story: Is An Aggressive Horse Brave or Just Insecure?